Men’s floral prints are back. Florals, tulips, flowers, roses. 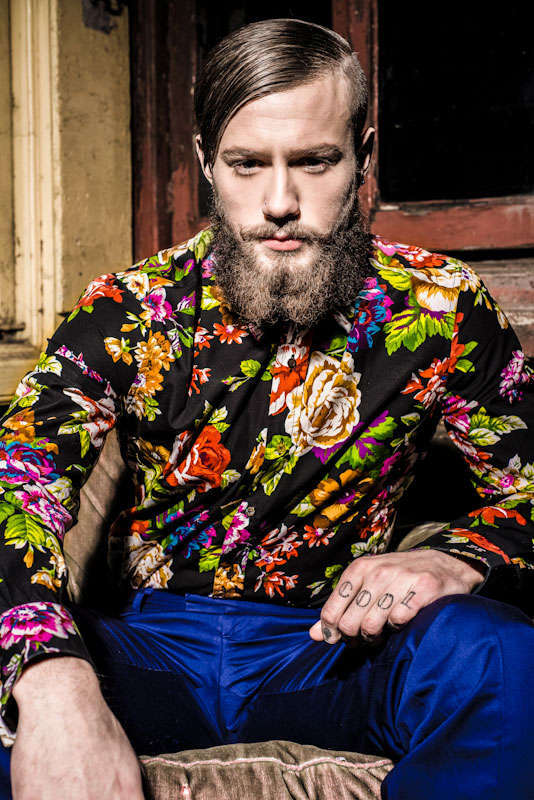 The men’s floral print trend is back here in 2014. This year we have seen the likes of designers such as Prada, McQueen, and Gucci all showcasing some form of a floral print into their latest releases. Big department brand names such as Zara, H&M, and Uniqlo have followed suit. And it’s all aimed at the fellows. If we look at past fashion trends, men once wore floral patterns in their everyday outfits. Then it disappeared and slowly, but has successfully started making a comeback. Modern fashion trends these days are all over the place, making it extremely unpredictable at knowing what’s going to start off something fresh that the public will latch onto. The 21st century seemed to start off with with a stigma of certain styles being metrosexual for men to wear. Floral patterns for men were a part of that view. Some will still have that close-minded mentality, but it seems that fashion for men has started to slowly creak open those creativity doors to a general public acknowledgement. 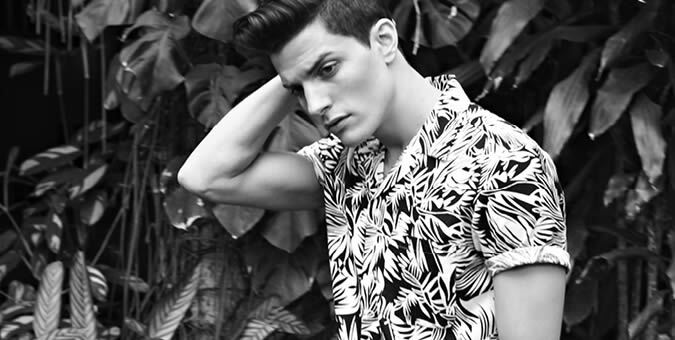 Floral print patterns are definitely a strong theme for men’s fashion in 2014. We are seeing these prints in all types of various forms including sport coats, ties, blazers, pants, and socks. It has become a widespread fashion trend for men and I believe will be a print that will start sticking around in men’s wardrobes as a staple piece. If men were to wear any type of floral pattern before it was from their purchases on their every year American family vacation to Hawaii. Tommy Bahama may still be aiming at that consumer market, but the newest trend has nothing to do with these types of designs. The new floral print men’s trend of 2014 has is about mixing subtle floral designs that are tailored as a detailed look to compliment an entire outfit. The other method we are seeing floral patterns for men is through an all-out bright colored floral pattern throughout an entire outfit that makes a defining statement. When shopping around you’re sure to witness men styling up a floral design one way or the other. 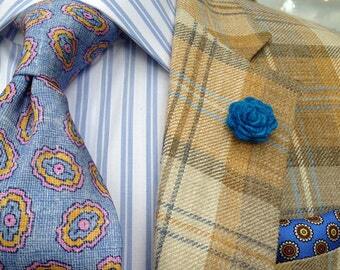 One of the most common forms I’ve seen the floral pattern utilized come in the form of accessories. As we look at the major style trends of the past few years all fingers will point to the re-development of socks. And this also incorporates the form of floral patterns. You will seen men rocking vibrant, rose patterns or a multi-colored variety of flowers that stands right out. The colorful, floral patterns add a nice aesthetic look to the overall outfit and bring out a attractive detail that’s usually overlooked in the sock. Lapel pins have also brought along their own re-instatement and especially in the form of flowers.The other major accessory we have seen flower pattern are in ties and bow-ties. Major department stores have really been emphasizing upon this and it seems that the public has been picking up on this accessory style pretty well. Combo up the tie with socks and you’ll be looking pretty dapper. As mentioned earlier, floral patterns have also showed up with the men who are really confident with an entire floral pattern outfit. I’ve seen it done in a couple ways. One is with the exact same floral pattern splattered throughout the suit coat, shirt, and pants. The other is by a mixture combination of different floral patterns throughout each piece of apparel. This way may be a bit riskier, but for the men who know how to combine up the patterns and color combinations in the right way it can work. You can always keep it safe and add in a solid color for one of your outfits pieces and still feel confident rocking a major floral pattern for the day. The men’s floral print of 2014 is back and here to stay for good at this point. Next time you go wardrobe shopping try picking up an accessory and get comfortable with it. If your confident enough pick up a button-down shirt or major outfit piece and style it up. Just stay on the right path and don’t wander off into the Tommy Bahama section.